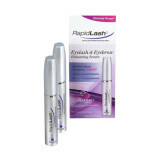 RapidLash is a revolutionary eyelash and brow enhancing serum that helps stimulate the hair to grow to the longest and fullest that it can possibly be. In just a few short weeks your eyelashes will look longer and fuller. By just applying the serum once a day to your lashes you are giving them the nutrients they need to be healthy resulting in longer and thicker appearance.